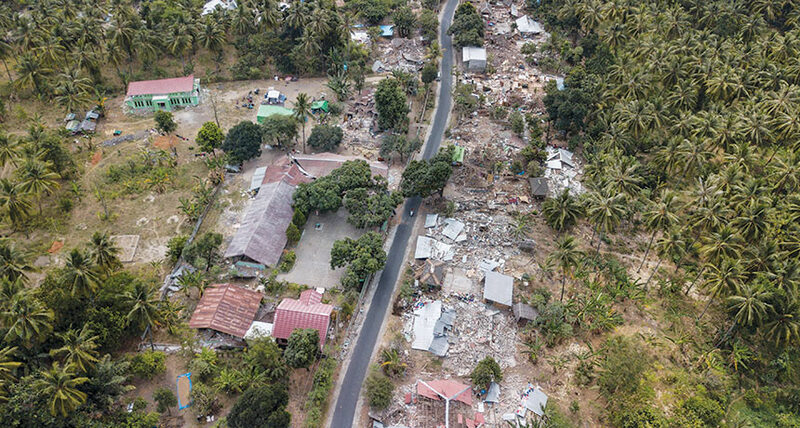 AFTERSHOCK DAMAGE Four days after a magnitude 7.0 quake shook the Indonesian island of Lombok on August 5, a magnitude 5.9 aftershock caused further damage to the rattled island. A new artificial intelligence is turning its big brain to mapping earthquake aftershocks. Scientists trained an artificial neural network to study the spatial relationships between more than 130,000 main earthquakes and their aftershocks. In tests, the AI was much better at predicting the locations of aftershocks than traditional methods that many seismologists use, the team reports in the Aug. 30 Nature. Although it's not possible to predict where and when an earthquake will happen, seismologists do know a few things about aftershocks. "We've known for a long time that they will cluster spatially and decay over time," says geophysicist Susan Hough of the U.S. Geological Survey in Pasadena, Calif., who was not an author on the new study. Then, in 1992, a series of temblors prompted a flurry of interest in trying to map out where exactly an aftershock might occur, based on how a mainshock might shift stresses on other faults. First, a magnitude 7.3 earthquake shook the Southern California town of Landers and other nearby desert communities. Three hours later, a magnitude 6.5 aftershock struck the more populous area of Big Bear, about 35 kilometers away. The next day, a magnitude 5.7 aftershock struck near Yucca Mountain, Nev., nearly 300 kilometers away. "After 1992, people were looking to understand [aftershock] patterns in more detail," Hough says. Researchers began trying to distill the complicated stress change patterns using different criteria. The most used criterion, the "Coulomb failure stress change," depends on fault orientations. But fault orientations in the subsurface can be as complicated as a three-dimensional crazy quilt, and stresses can push on the faults from many different directions at once. Imagine a book sitting on a table: Shear stress pushes the book sideways, and might cause it to slide to the left or right. Normal stress pushes downward on the book, perpendicular to the table, so that it wouldn't budge. Such a thorny computational problem may be tailor-made for a neural network, Hough says. Seismologist Phoebe DeVries of Harvard University and colleagues fed data on more than 130,000 mainshock-aftershock pairs into an AI. Those data included not only locations and magnitudes, but also different measures of changes in stress on the faults from the quakes. The AI learned from the data to determine how likely an aftershock was to occur in a given place, and then the team tested how well the system could actually pinpoint aftershock locations using data from another 30,000 mainshock-aftershock pairs. The artificial intelligence system consistently predicted aftershock locations much better than the Coulomb failure criterion, the researchers found. That's because the AI's results were strongly correlated with other measures of stress change, such as the maximum amount of change in shear stress on a fault, the scientists say. "It's a cool study and might pave the way for future work to improve forecasting," Hough says. But the study focuses just on static stresses, which are permanent shifts in stress due to a quake. Aftershocks may also be triggered by a more ephemeral source of stress known as dynamic stress, produced by a quake's rumbling through the ground, she says.